1. Entry is open to anyone and Writers are free to write on any topic, in any language. 2. Duration of drama script should not exceed 20-30 minutes. 3. Entries received after 08-January-2012 will not be considered. 4. 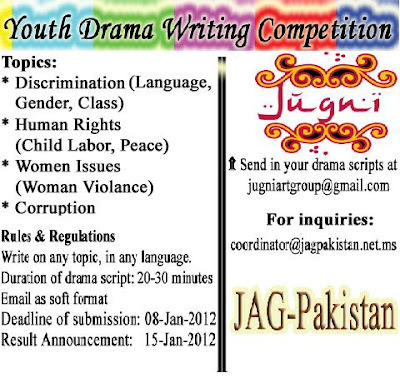 Drama script(s) should be emailed as soft format (scanned file or document file pdf/doc/jpg). 5. 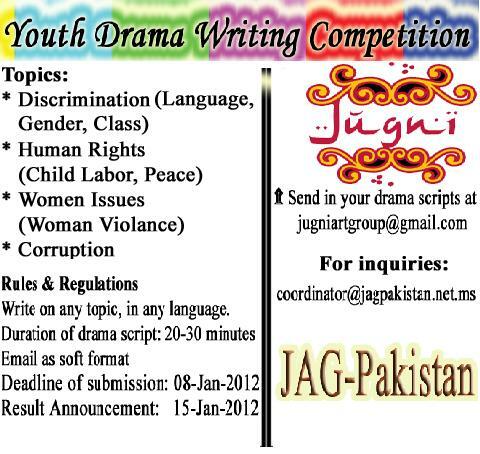 With your submissions kindly email your full name, address, drama title, contact details (cell number). 6. The script should not have been previously published/performed anywhere in full or part. 7. All submissions will be subject to review. 8. Plagiarism is a crime- abstain and script(s) should be according to above mentioned topics!! Drama script will be selected for their originality and imagination, use of good dialogue, a compelling story with a believable plot, characters and structure, use of the medium of theatre and how practical the play would be for the society to produce awareness. Scripts sent to a panel of judges, who meet for a day to discuss the shortlist and decide upon the winners, using their judgment of the criteria above. Following the final judges' meeting, the winners' names and the titles of their plays will be posted on the website on 15-January-2012.